Chronic Illnesses Outpace Infections As Big Killers Worldwide : Shots - Health News The pattern of illness around the world is changing much faster than researchers expected, a series of report finds. The leading causes of death and disability have changed from communicable diseases in children to chronic problems in adults, including diabetes and mental illness. 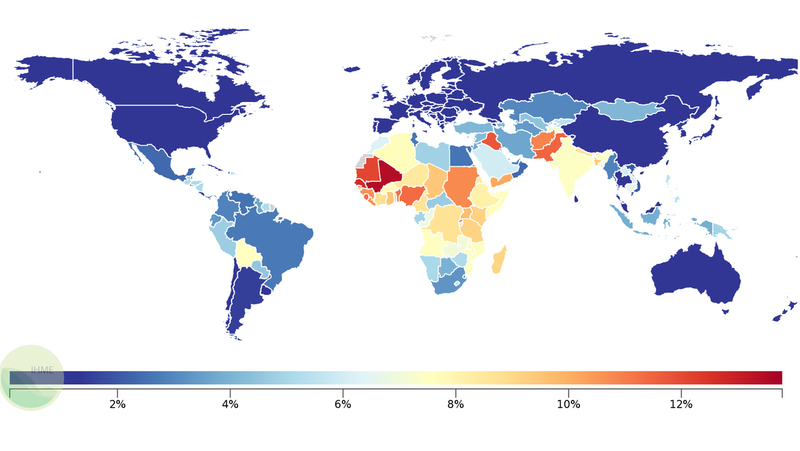 Percentage of deaths each year due to neonatal disorders around the globe. People around the world are getting healthier and living longer. Infectious diseases are declining around the globe. But at the same time, chronic health problems are on the rise, particularly in developing nations. These are some of the key findings in the latest reports released by the World Bank and the Institute for Health Metrics and Evaluation. The groups published a broad analysis of the disease burden worldwide in December. The latest reports break down the data for six regions in the world and provide a more detailed look at the rapid progress made in many low- and middle-income countries. For instance, a child born in El Salvador today is expected to live 40 years longer than a child born there in 1970. A woman in Bangladesh is much less likely to die in labor than she would have two decades ago. "The leading causes of death and disability have changed from communicable diseases in children to noncommunicable diseases in adults. Eating too much has overtaken hunger as a leading risk factor for illness," the report states. "The pattern of illness is changing rapidly, much faster than many expected," says Tim Evans, a health and nutrition specialist at the World Bank. "Twenty or 30 years ago, we were dealing with diseases that were killers — childhood killers, infectious killers. Now we are dealing increasingly with diseases that are not primarily killing but causing chronic illness — heart disease, injuries, mental health." And those issues are increasing in virtually all parts of the world, even in low- and middle-income countries. In the Philippines, for instance, diabetes is now the fifth-leading killer, up from 20th place two decades ago. In the Middle East, road injuries are now the fourth-leading killer and have jumped ahead of diarrheal diseases, birth defects and complications due to a premature birth in the rankings. Even sub-Saharan Africa is making significant progress against infectious diseases. Measles has dropped to the 33rd place as a cause of death on the continent from the sixth position in 2010. Africa is the region where disease conditions are changing the fastest, Evans tells Shots. "We are seeing [infectious disease] rates coming down from very, very high levels," he says. "They had a long way to descend. And they still have a fair way to go." Africa remains an outlier on the global disease map. It's the only place on the planet where malaria and HIV/AIDSremain the top two causes of death. In most of the rest of the world, heart disease is the dominant killer. The reports, published on the IHME's website, look beyond just death rates. They also chart disabilities and chronic illnesses that may not kill us, but reduce our standard of living. The big trend that emerges there is that as people live longer, those extra years are often darkened with nagging health conditions that will require medical care. In countries with rapid economic growth, diabetes, cirrhosis and kidney disease are on the rise. Also, depression and suicide are cutting years from people's lives in places where mental health services are rudimentary. As economies race forward, health systems don't always keep up. Or they keep up only for the rich. The emergence of higher levels of chronic conditions can end up skewing a country's health care system to serve primarily a burgeoning middle class, Evans says. That poses a danger, he warns. "The poor need to have equal access to [health care] services. And this isn't always a given," he says. "Fees shouldn't keep them in poverty or push them into poverty."